Johanne Daoust in Toronto has new photos of her 2012 rooftop garden on Flickr. She converted her entire garden to sub-irrigated planters (SIPs) in 2011. Johanne is a true SIP innovator. She shows a number of new ideas in this Flickr photo set. One of them is a "sack SIP" (photo left). New Proposal in New York City » New Hydroponic Greenhouses? Speaking of hydroponics. A proposed change in zoning could bring a significant increase in commercial for-profit hydroponic greenhouses like Gotham Greens on rooftops in New York City. If you are not familiar with the Rooftop Garden Project in Montreal, it is arguably the best place in the world to learn about rooftop gardening and urban gardening on any level. Short of going to Montreal you can visit their website and download a free rooftop garden guide (PDF). They make and sell sub-irrigated planters (SIPs) in their local community (see below). It is difficult to understand why community gardens here in New York and elsewhere are not doing this. Learn more about them in prior posts including their partnership with the award winning McGill University Edible Campus. The construction of the sub-irrigated planter (SIP) above and the one I called the Laptop of Fresh Food are basically the same. Neither of them require power tools to make. Both are very simple designs. Watch the progress of an "instant rooftop garden" at the Harold Washington college, one of the seven City Colleges of Chicago. 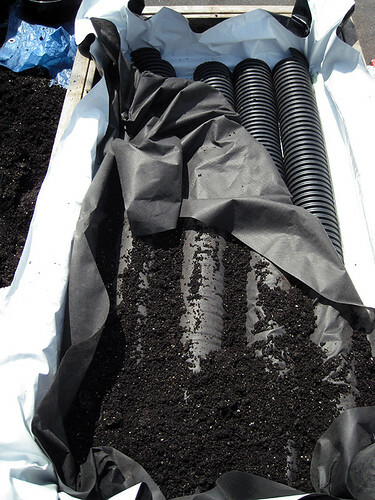 Using sub-irrigated planters (SIPs) like these EarthBoxes it took a minimal amount of time and effort to create a highly productive and portable edible garden for the benefit of the students and faculty. What you see here is only the initial test garden installed last summer. The plan is to expand the project throughout the City Colleges of Chicago system in the future. 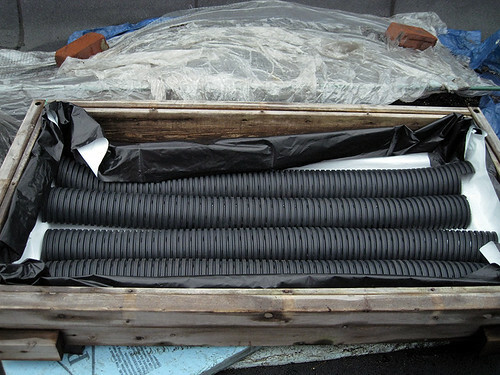 The EarthBoxes were donated by the E.A.T. organization in Chicago. They deserve much credit for what they have done. Read more about the project on the Harold Washington college blog. We would surely benefit from an E.A.T. type organization here in NYC where we seem to be stuck in the dirt. This too shall pass. The light of modernity is slowly dawning and it will happen before too long. If you don't know Cathy Erway, she is author of The Art of Eating In, a food maven and blogs about it. In her spare time Cathy is also a rooftop farmer having launched a micro farm atop the Six Point Craft Ales brewery in Red Hook Brooklyn last year. What is particularly unique about this micro farm is that Cathy crafted her planters from recycled beer kegs. Last years creative idea has become even better since Cathy discovered the benefits of sub-irrigated planters (SIPs). Having an open mind, she was more than willing to convert part of the micro farm to test the SIP concept. You can now think of these planters as SIP beer kegs for a bit of a pun. You can read Cathy’s own words about the sub-irrigated keg planter test. She is overjoyed to see the superior growth of the plants in the SIP keg planters. It’s high time I shared the revelation that’s come to our rooftop garden. This project has been months in the works, and years if you count the work of my consultants on this project, who have dedicated their life’s work to exploring and sharing the virtues of SIPs (sub-irrigated planters). And now that the sun has been beating down hard on the rooftops of Red Hook, these uniquely outfitted keg-containers have proven themselves so much worthy of the effort that was put into them. The plants in SIPs are really outdoing all the others. Last fall, I became aware of a gardening tip ardently encouraged by a horticulturist named Bob Hyland, of Inside Urban Green. 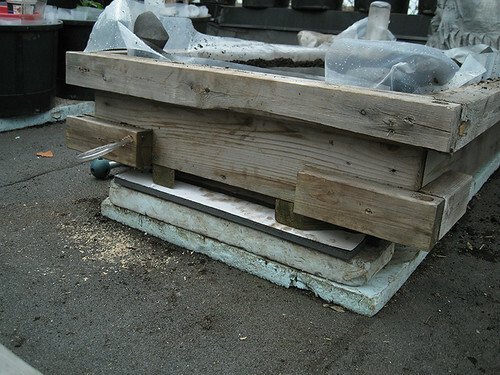 His recommended system for healthy, productive plants in tight quarters such as the city was by sub-irrigation. 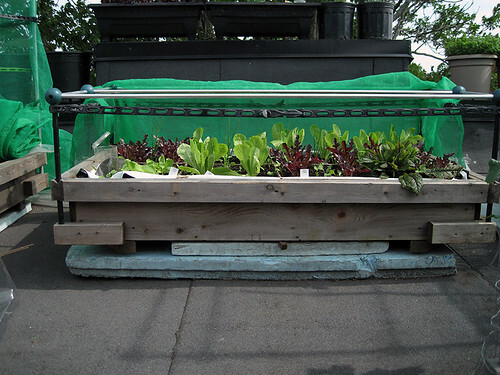 It was good to read this informative Edible Manhattan article by Rachel Wharton that gives some well-deserved recognition to portable micro gardens that incorporate sub-irrigated planter systems (SIPs). We have serious problems regarding obesity, nutrition and job creation. While not a complete solution, these modern methods of urban food production can make a very significant contribution to solving these problems. They are simple to use and clearly belong on everyone’s menu of food production techniques. I have some ideas about job creation in particular that I will share in the very near future. Jobs, jobs, jobs are the top priority. Without them we don’t all eat.